Discussion in 'GameMaker Studio 2 Community Tech Support' started by Northernlightifly, Nov 6, 2018. I'm learning how to use gamemaker so I'm making the clown catch game turtorial in order to learn. I'm finished making the game and can now test run the game. But unfortunately I get an error that it can't find the file? 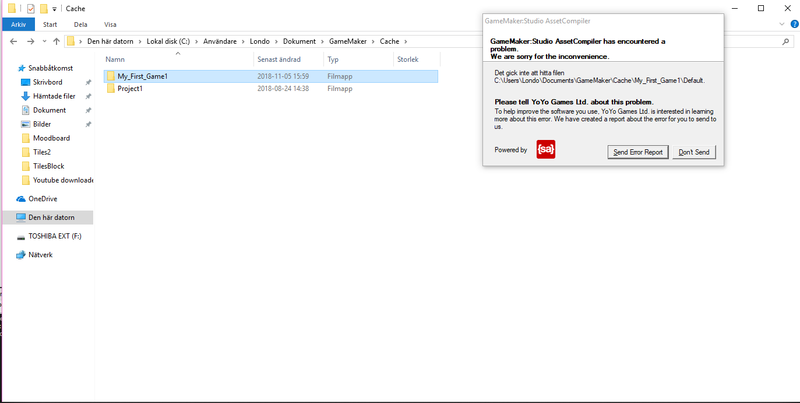 I think it might be because I have game maker installed on my disk(F) and I also have the project file there but I'm not sure...does anyone know how to solve this? Where is your project stored? Is it opening correctly in the IDE and can you run it from there? It's stored in my (F)drive but I managed to fix it thank you anyway! Can you disclose what the solution was? Just in case someone in the dark, distant future comes across this thread with the same problem. Create a new folder in the local disc and in that folder, in that folder create the following in the map: local, cache, backup, project. Go to start in the windows start menu and write "regedit"
Go to menu and "edit" and chose "search"
Okay, where's the other forum then?